Dr. Jess Wade’s project of creating Wikipedia pages for Women in STEM – she’s written about 270 in 2018 so far, which is an amazing feat – has recently been getting a lot of well-deserved public attention. We’ve known for years that women are under-represented in Wikipedia, reflecting the demographic make-up of the volunteer writing and editing community. The Wikipedia Editathon, as an antidote to the under-representation of women in STEM (science, technology, engineering and mathematics), has flourished as an International Ada Lovelace Day activity, although I would like to see this activity spread further in Canada. Wikipedia Editathon projects have also been held for other fields and subjects, like the arts and psychology. 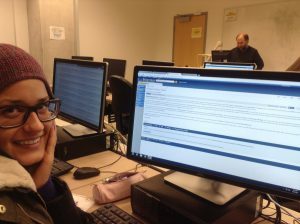 Melissa Peretta learns about editing & creating Wikipedia pages from John Dupuis (background) in a January 2014 Plant Ecology course lab. My colleague, York University Librarian, John Dupuis, who is based in Steacie Science and Engineering Library and I, first discussed holding a Wikipedia Editathon in Fall 2013, but we soon realized that we first needed to figure out how best to teach students to be Wikipedians. This is why it took us two years before we held our first university-wide Wikipedia Editathon, in 2015. John and I worked on how best to guide students along the learning curve for editing, writing and creating Wikipedia pages. In 2014, John helped me to teach a three-hourWikipedia editing lab. in an upper year Biology course. 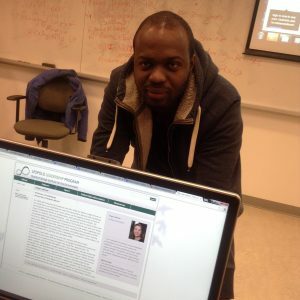 This gave me an opportunity to learn how to edit and create Wikipedia pages. I learned some sp/k and fortran computer language in the 1970s, and how to write SAS code for statistical analysis in the 1980s. Nevertheless, I found the Wikipedia markup language to be quite clunky. Fortunately, there are now templates to make the editing and creation of pages go more smoothly. 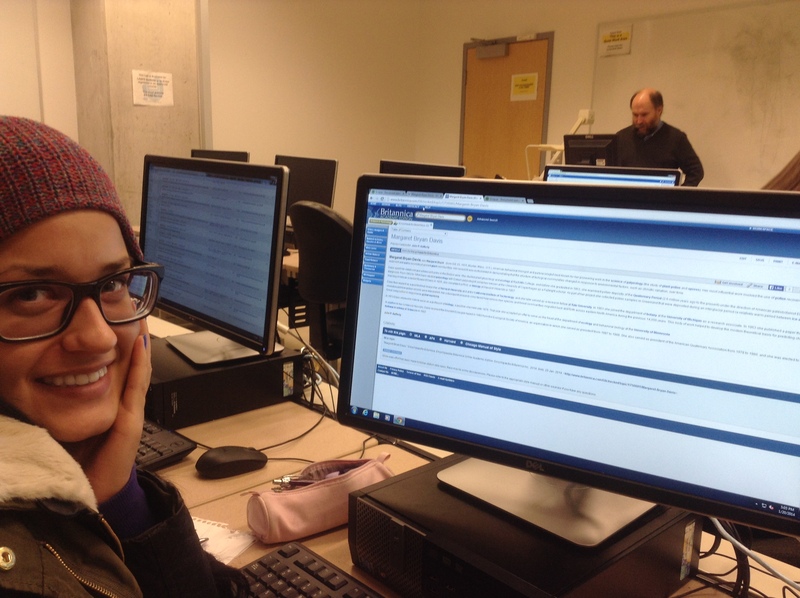 Kimanie Sterling learns about editing & creating Wikipedia pages from John Dupuis (background) in the January 2014 Plant Ecology course lab. The Wikipedia Assignment that I developed for my course is laid out below. An overview of the three-hour Wikipedia Editathon workshop that I gave in March 2018 at Visva Bharati University in West Bengal, India, is given in another post. In this assignment, you will learn where web-based Wikipedia content comes from, and how to create web-based content yourself. You will create additional text for an existing Wikipedia page about a prominent Ecologist (male or female). Please clear your choice of the ecologist with me, and add their name, and the Wikipedia page link to the Moodle forum. I am looking for 250 words of text for which every statement must be backed up by a 3rd party reference. The assignment will include the name of the person, their Wikipedia page link, the new text and all of the references to back up what you say about the person’s life, research and significance. In 2014, this Plant Ecology assignment was led by Steacie Librarian, Mr. John Dupuis: his lecture slides are available on Moodle. This assignment is rooted in the idea of the Wikipedia Edit-a-Thon projects aimed at getting more Wikipedia entries for Female Scientists (Twitter hashtag #WomenSciWP). We have adapted this idea for this assignment, where we want to expand the existing Wikipedia page content for prominent Ecologists of all genders. To repeat, in this assignment, you will not be creating new Wikipedia pages, but rather adding to an existing one. In Week 3, you will use your Library Training Session time to search for a plant ecology journal article published during the year you were born, to form the topic of your research essay. You can also use this time to search for a famous ecologist to be the subject of your Wikipedia page assignment. The ecologist/female scientist that you select, may or may NOT already have a Wikipedia page. Lots of people on the eminent ecologist list don’t have their own webpage. Ideally, we want to start new pages (stubs), although you may also work on expanding an existing page – there are lots of these stubs out there. But, before making new pages, you will practice editing an existing page.